A 'must' for every music loving tea and coffee drinker. 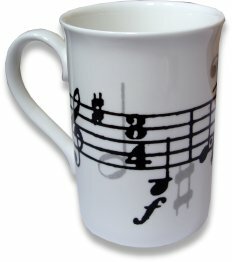 This musical theme mug has a black and grey music note design, and makes a fun gift or stocking filler. Please note - although we take as much care as possible to show pictures of the actual range of products available, occasionally the designs & colours may naturally vary slightly from those shown.